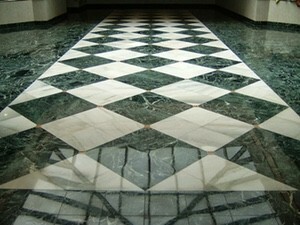 Marble restoration options include grinding, resurfacing and crystallization. • Resurfacing is less expensive than grinding, but it can also be costly. The process uses a floor machine with polishing pad, as well as an oxalic-acid or tin-oxide powder blended with fine abrasives. Resurfacing cannot be performed on cracked marble. • Crystallization produces a chemical change in the surface of the stone, making it shinier and easier to maintain and requires specialized equipment and chemicals. Sealing and Finishing Marble Floors- To avoid damage, deterioration and powdering, marble and other natural stone surfaces need to “breathe”. Therefore, any surface protection must be permeable. Both sealers and impregnators can protect marble from dirt, water and stains while retaining permeability. Each one also aids in abrasion resistance. Sealers form a protective layer on top of the marble and impregnators penetrate the stone to close pores just below the surface to avoid damage. Cleaning and Refinishing Marble Floors- To ensure proper protection, marble floors subjected to heavy traffic should be cleaned and recoated every 6 months. To routine clean and recoat marble floors- dust mop to remove soil and debris. Dilute neutral cleaner according to manufacturer’s directions and place in an auto scrubber tank. Pre-soak pad in solution before attaching it to the machine. When all areas have been scrubbed, allow the floor to dry completely before applying sealer or impregnator. Mop floor coating in thin, even coats. Burnish fl oor with pad recommended after 2nd coat has dried. Dust mop. To strip and refinish marble floors- dust mop loose dirt and debris. Prepare stripper according to manufacturer’s directions. Apply stripper generously to workable area (10×10). Let stripper dwell, but do not let it dry on the floor. Agitate stripper with mop or floor machine (Twister Red below). Wet vac stripper solution immediately and rinse with solution of neutral cleaner and cool water. Damp mop twice with clean water. Continue steps until floor is stripped. After stripping, allow stone to dry completely so the fi nish will bond properly. A 24 hour drying time is optimal. Apply finish with smooth, even, straight line strokes. Lamsbwool is preferred for smooth marble surfaces.